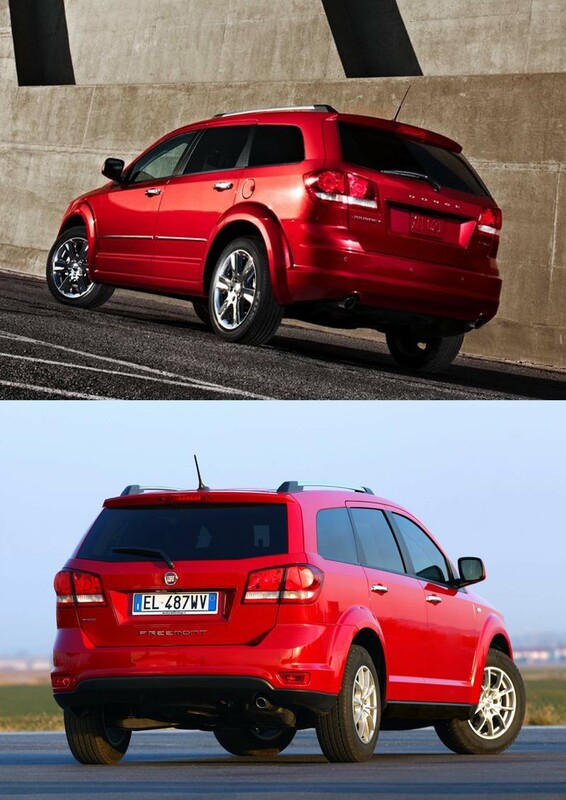 The next model to be analyzed is the Dodge Journey, also known as Fiat Freemont in some other markets. It was conceived as a new concept of vehicle intended to catch those clients looking for roominess in a car that is not as tall as a SUV and not as big as a MPV. This Dodge, which could be considered a Crossover, was presented in 2007 in Frankfurt Motor Show and available in American market in the first quarter of 2008. Chrysler used Dodge Avenger’s platform to create this mid-sized MPV (for segmentation reasons is closer to a Multi-Propose-Vehicle than a SUV) as a smaller and more practical version of big Chrysler Town & Country/Dodge Grand Caravan. This kind of cars is very popular in North America and they did a very good job as sales figures confirm it. The Journey became a referent in a new segment, which by the time of the launch of this car, was almost unknown in the US and Canada. Since its launch, Dodge has done quite good with this product, not only in the positioning phase, but also with the updates it has had so far to keep it as a fresh product. It has also become an interesting option in those other markets where it is available, and was the base for the development of the first rebadged Fiat, the Freemont, on sale in Europe and Brazil. It is considered a MPV as it can transport up to seven passengers in a car that is not as tall as a regular SUV. The car is as big as its origin, where big cars are the most popular. It is 4.88 m length and 1.87 m wide, and that’s why there it can accommodate without any problem, up to 7 passengers in the top versions. Unlike some other real MPV, its rear doors are opened normally as any other regular car. Because of its measures, the Journey is positioned in two different segments according to the market. Normally it would always be considered a ‘D-MPV’, the top segment for MPV. But in America Dodge offers a larger MPV, called Grand Caravan, which is also considered a ‘D-MPV’. 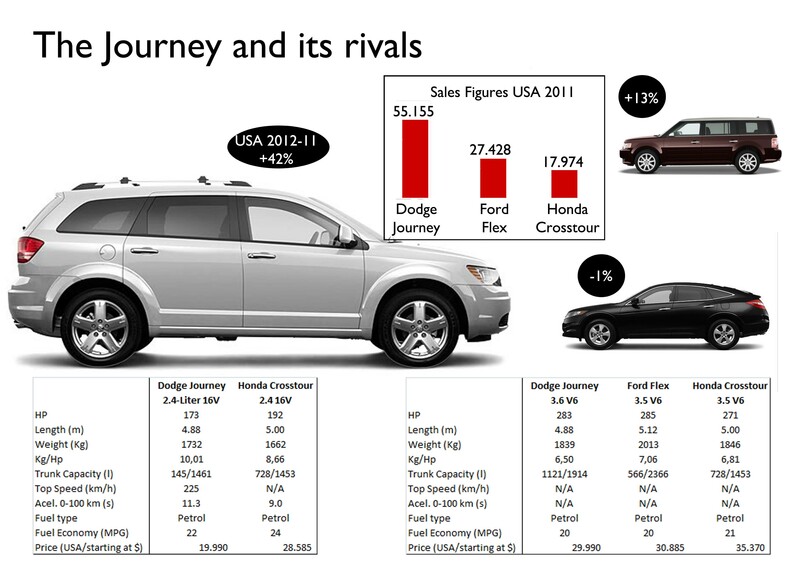 For segmentation reasons in America, the Journey is part of mid-sized MPV, or ‘C-MPV’ segment. In Europe, where big MPV are not that usual, the Fiat Freemont is considered a ‘D-MPV’ because of its size and its competitors (the Freemont is closer to a VW Sharan than a Touran, or closer to a Renault Espace than a Scenic). 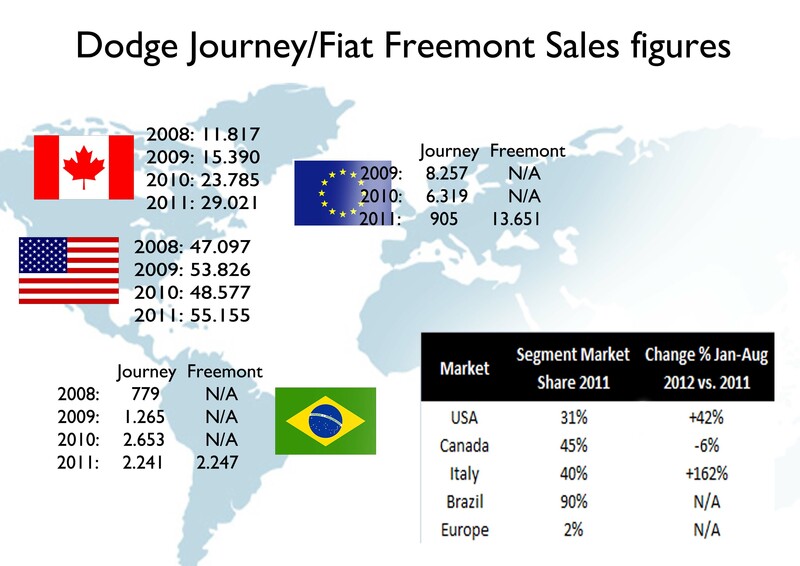 The segmentation of the Journey/Freemont according to the market is more or less the same what happens with the Fiat Linea in Brazil and Europe, where the same car is positioned differently and so does the client approach. 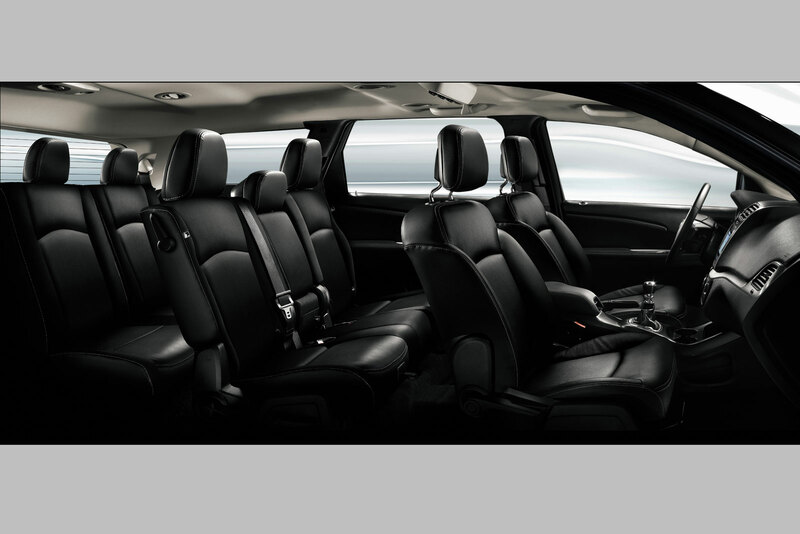 At any case the Journey is a different option from the Grand Caravan, aka Chrysler Town & Country or Lancia Voyager. It is more sporty and less family car than those big MPVs. 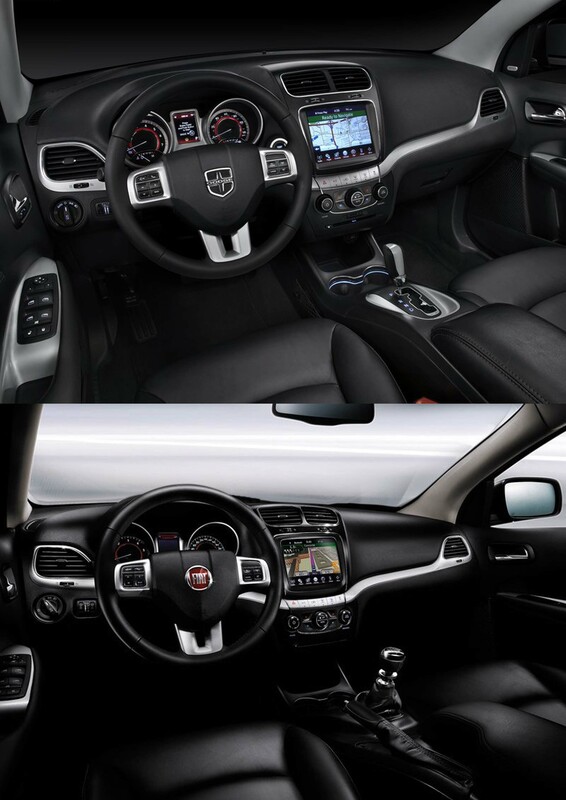 The car got its first facelift in 2011 when Fiat began selling it in Europe, so they decided to improve its interior and add some engine options. 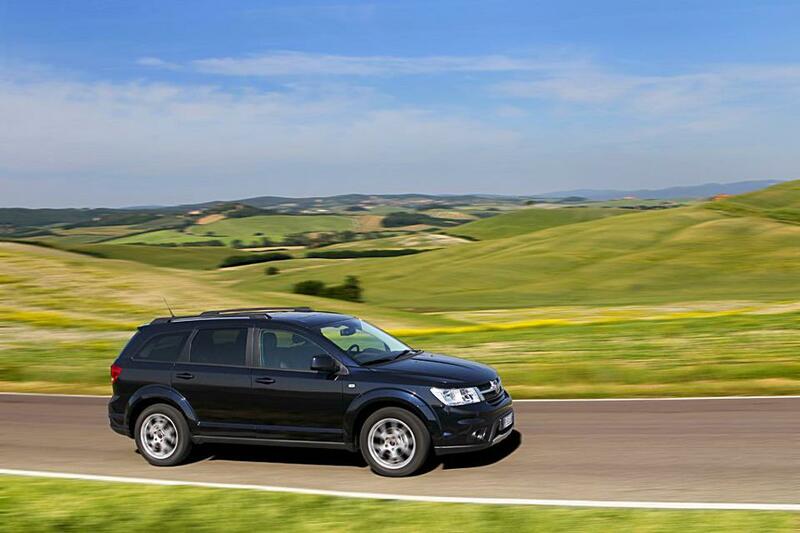 Before that, European clients used to received the Dodge Journey in Chrysler dealerships, but Marchionne and his team decided it was an excellent product and it deserved better sales figures using Fiat brand. And it worked, even though it could have better results if it was not because of the European car industry crisis. 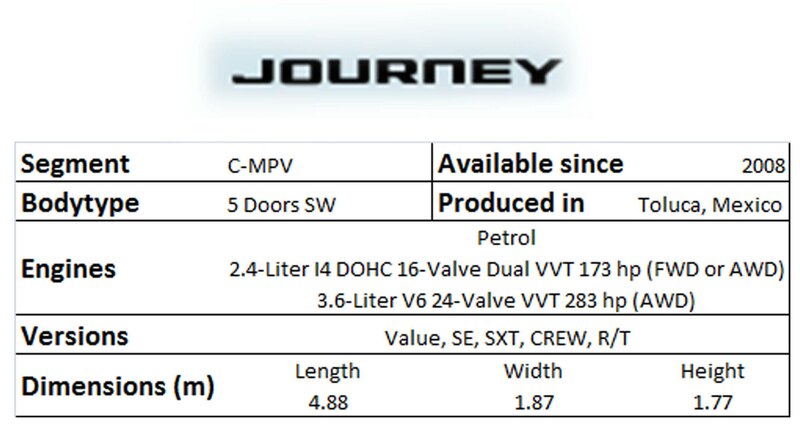 During its first year in the US, the Journey sold more than 47.000 units, while American market was dealing with the deep financial crisis years. But when things seemed to be bad for car sales in USA and Canada, the Journey did very well. Produced in Mexico, it has always benefited from low labor cost so its price is some how competitive. That’s also the same place where the rebadged Freemont is produced for Europe. But good sales did not stop. The Journey was Chrysler’s only product to rise its sales figures in 2009. 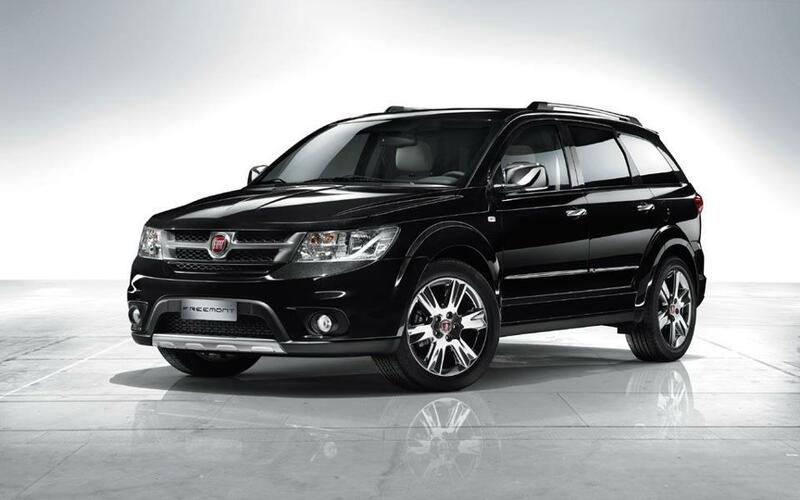 In Europe it was presented as the Fiat Freemont in Geneva 2011 with sales target of 40.000 units per year, half of them in Italy. And at least Italian results have proved the target is not unreal. The car intends to be a successor of not one but 3 models: the Fiat Ulysse, Multipla and Croma. As it is a car conceived for American market, it is offered with big and powerful American engines. In US market the offer is composed by 2.4-Liter 16V Dual VVT and 173 hp, and 3.6L V6 PentastarVVT and 283 hp. In Europe there are 3 options: 2 diesels and one petrol. The first two are a 2.0 Multijet with 140 hp and 2.0 Multijet with 170 hp. The petrol one is the same American Pentastar engine with 283 hp. All of these engine options are available with front or all-wheel-drive transmission. It is why the car can perfectly compete with a full equiped MPV or a mid size SUV. But as it is a weird product is not easy to find direct rivals. In North America, it belongs to ‘C-MPV’ so its main rivals are Ford Flex and Honda Crosstour. In Europe its has more rivals as it is one segment above. 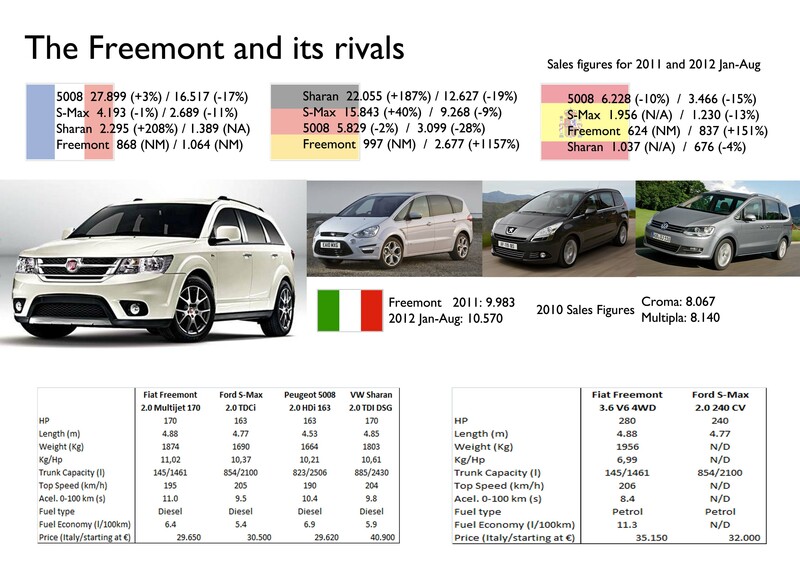 The Freemont must compete with Ford S-Max, Peugeot 5008, Renault Espace and VW Sharan. In many cases the Journey/Freemont is cheaper than most of them and offers practically the same advantages in a more compact car. It explains why the Journey became America’s best-selling mid-sized MPV and in Europe the Freemont is now in Top 5. Brazil and China are the only markets to receive both versions, the Journey and Freemont. The future for the model? it is not clear yet whether Fiat and Dodge will develop the second generation together. But certainly the success the car has had in both sides of the Atlantic ocean is a key factor to develop a future generation together. 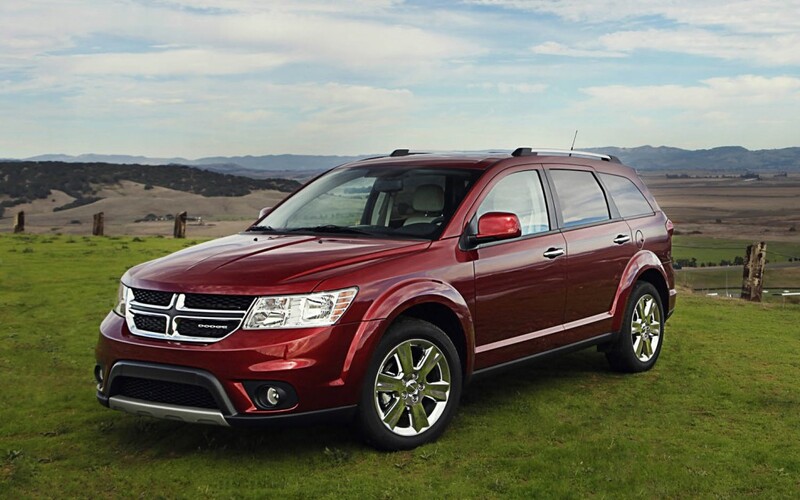 Dodge can offer sporty and family cars. Fiat is well-known for its family and practical cars. 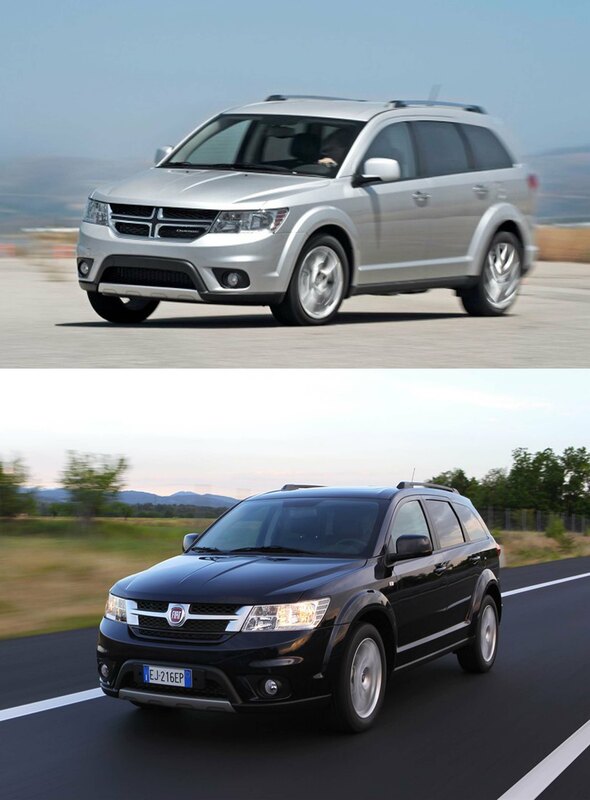 Dodge/Fiat Journey = Value for money!